Pointwise gives you the ability to manipulate practically every aspect of your grid. Although this provides the ability to devote attention to the object being studied – the airfoil, turbine blade, or in this case, a landing gear assembly (Figure 1) – it can be a cumbersome interactive task to select entities to modify individually. Fortunately, Pointwise has several features that streamline the selection process. This geometry was given to participants in the BANC-III workshop with the goal that they identify the state-of-the-art in aeroacoustic simulations for noise-prediction studies. 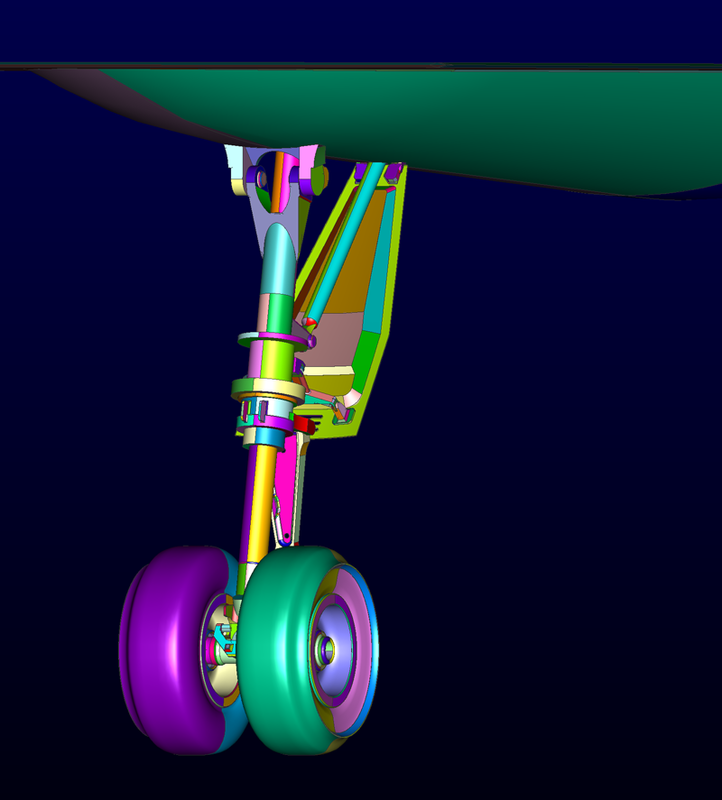 Figure 1: The landing gear geometry provided for the BANC III workshop had a number of complex features and thousands of entities in the final mesh. By starting with the surface of the object being modeled, you have the ability to ensure that boundary layers are properly resolved (i.e. the wall spacing is appropriate for its particular simulation) and the near-wall cells are of a sufficiently high quality. This represents a different approach than that of some other preprocessors; the philosophy at Pointwise is that it is only logical to begin the mesh where some of the most interesting physics (or at the very least, the origins of such physics) are bound to occur. Figure 2: The select menu has a number of useful commands to improve the efficiency of your workflow. There are times when you wish to select all types of entities, and others when you only want to select a particular one. 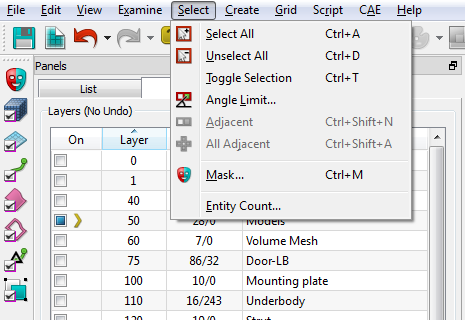 The Masks toolbar in Pointwise allows you to control exactly the selection process. To expedite switching between various masks (i.e. switching between selecting connectors and domains), you can either select the mask in the toolbar (seen on the far left in Figure 2), or use the accelerators listed in Table 1. You also can toggle the entity mask by holding down the Shift key in conjunction with the accelerator. Table 1: Helpful Mask accelerators can expedite the selection process. Further, you can also specify large number of specific criteria via the Select, Mask panel (Ctrl+M) (Figure 3). Figure 3: The Selection Mask panel contains many criteria that can be used to select very specific entities. This flexibility can be very useful if you have a particular type of domain you wish to select: a domain that is structured or unstructured, a domain that has been refined with the elliptic solver, a domain with a specific number of associated blocks, etc. The selection mask is a global setting that will control the type of entities selected using any of the following selection techniques. The mouse can be used to rapidly select multiple entities in close proximity using Box Selection. When you click and drag the mouse over the entities you wish to select, Pointwise defaults to select all masked entities that are inside or touched by the red box shown on the screen as in Figure 4 (i.e. if you catch only a corner of a domain, the entire domain will be added to the selection). Hold down the Shift key before clicking and dragging if you wish to only select entities contained entirely within the box drawn. Figure 4: A selection box is shown on-screen when you click and drag. The Select Adjacent command is another very useful selection feature in Pointwise. By default, this command (Ctrl+Shift+N) selects all entities directly connected to the currently selected entity. The Select All Adjacent command (Ctrl+Shift+A) selects all topologically connected entities. That is, if a domain is selected and you specify the Select Adjacent command, then all domains sharing an edge with the selection will be recursively added to the selection until all domains connected to the initial domain are selected. This is very useful when selecting an interior surface of a block. Figure 5: The Select All Adjacent command in conjunction with Angle Limits can be used to rapidly select entities that form a common face. In the left image one domain has been selected and highlighted in pink. Then after using Select All Adjacent, all domains adjacent to it have been picked as shown in white in the right image. Pointwise also has an Angle Limit feature that can be used in conjunction with the Select Adjacent and Select All Adjacent commands. 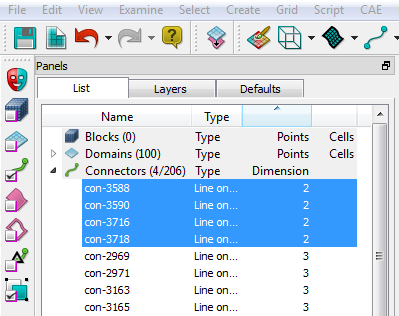 By specifying an Angle Limit in the tool bar, you can restrict the adjacent selection to domains/connectors with normal vectors that differ by less than the specified value. 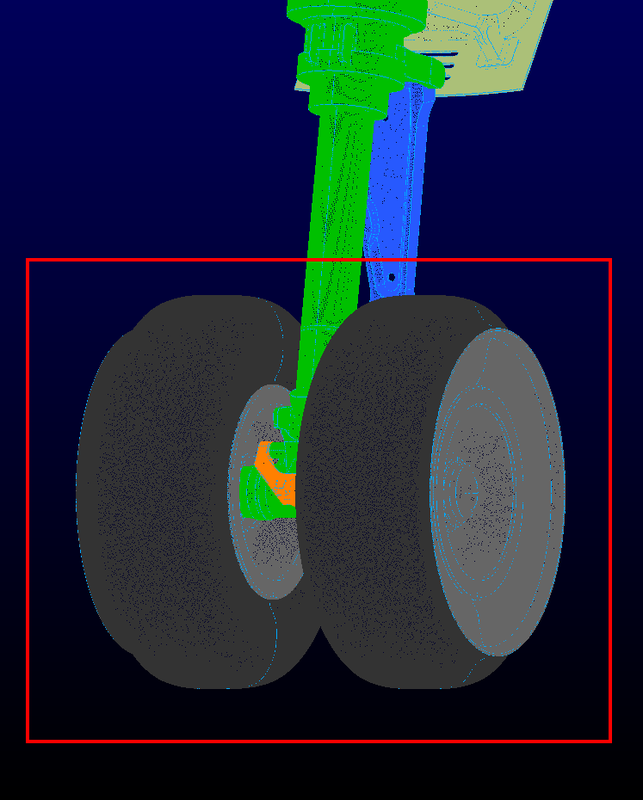 Suppose, for instance, you wish to select the underbody of the landing gear assembly as seen in Figure 5. When you specify an Angle Limit of 10 degrees, you can rapidly select the entire underbody and nothing else by selecting any of the constituent domains of the underbody and executing the Select All Adjacent command. In other words, the Select All Adjacent command can be used to select all domains up to a hard edge that defines a clear corner in the topology. If you are frequently working with a collection of entities that form a subset of your total project, you have the ability to place your work in Layers so that you may isolate a portion of the mesh, both freeing up graphical resources and reducing the complexity of the model being adjusted. By isolating a layer, all other entities are hidden from view (and selection), making it very easy to select all entities within a single layer either with Ctrl+A or by clicking the “Add To Selection” button seen in Figure 6. Figure 6: The Layers panel allows you to compartmentalize your project and rapidly add all components of a layer to the current selection. 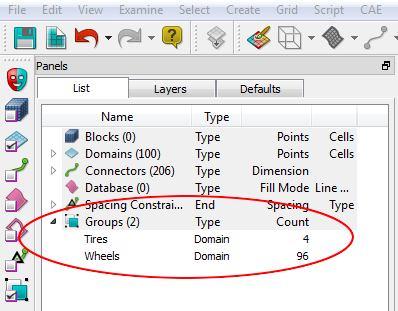 Creating a Group for rapid selection will be helpful if you frequently select a number of disjoint entities of the same type (connector, domain, etc.) spread throughout a model (for example, structured domains to diagonalize on trailing edges). First, select the entities you wish to bundle into a single group using additive selection (hold down Ctrl while selecting). Then, you create a group by clicking Create, Group from the tool bar. The Group becomes visible at the bottom of the List panel (Figure 7). All of the entities can be selected with one click by turning on the Groups mask and selecting the Group from the List panel. Note that each of the entities is entirely independent of the Group; the Group merely provides a way to rapidly select an assortment of entities rather than having to select each individually. Also, suppose you want to select everything currently visible and masked, but not included in the current selection. You can do so very easily by toggling the selection (Ctrl+T). Figure 7: Creating Groups is an easy way to gather entities of the same type in different layers for rapid selection. One last useful method of selection involves the List panel. Suppose, for instance, you want to select all connectors with a dimension of 2. Click the third column heading to sort by dimension and drag over the connectors with dimension 2 (Figure 8). Figure 8: Selection can also be done in the List Panel. 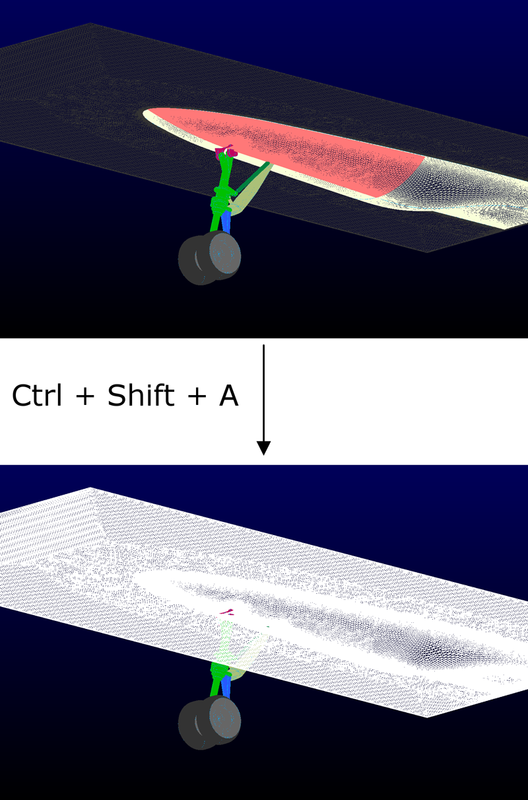 The multiple methods of selection are just one example of how Pointwise is designed to maximize user efficiency and provide tools that allow you to realize high-quality grids for your computational fluid dynamics (CFD) needs. If you want to see what else Pointwise can do to help improve your preprocessing workflow, request a demo of the software.